GYS Development LLC sold its newly completed South College Self Storage facility in Fort Collins to a national self-storage owner and operator. Storage Star, which is affiliated with Northern California-based real estate investor FollettUSA, purchased the 708-unit facility at 137 W. Skyway Drive. The price wasn’t disclosed, but Larimer County records show the property sold for $10.45 million. GYS Development opened the facility March 1. “GYS Development LLC creates best-in-market self-storage projects that attract industry leading buyers. Storage Star/Follett USA is the type of superior owner-operator that appreciates the value that was generated at the South College site in Fort Collins, and they will continue to increase the asset value with their strong operating platform,” said Brandon Grebe of GYS Development. “When we bring these exceptional projects to market, we work directly with groups like Storage Star/FollettUSA in order to allow for maximum profitability on both the buyer and seller side of the deal. This certificate-of-occupancy sale represents the culmination of another successful strategic partnership between GYS Development and All Pro Capital,” he said. South College Self Storage is a three-story, split-level building with a combination of interior climate-controlled units and driveup units along the perimeter. The building, which includes a sales/ leasing office, comprises 105,300 square feet. GYS Development LLC, owned by Lee Frederick and Grebe, is a vertically integrated real estate development company that focuses on self-storage facilities in the Western United States. “GYS Development builds a best-in-class product in difficult-to-develop locations. We are fortunate to have transacted with such a high-quality group of professionals,” said Matt Garibaldi, president of Storage Star and FollettUSA. An 18-unit apartment building at 812 City Park Ave. in Fort Collins sold for $3.55 million, or $197,222 per unit. Records show North Quarries LLC and Oak House LLC purchased the apartments from Tri Stone Properties LLC. The property consists of all two-bedroom, one-bath units that had been condominiumized. The buyer wanted to add apartments to its portfolio with the option to sell individual units in the future, according to Phil Dankner of the Greystone Unique Apartment Group, which represented the seller in the transaction. The apartments were built in 1982. A 1031 exchange buyer paid $2.73 million for a newly opened Brakes Plus building at 4555 City Centre Road in Firestone. BPCO Properties LLC sold the 4,935-sf building to 602 Park Point LLC. The buyer is a Colorado investor who was exchanging out of an office building and looking for a passive investment, Isaac said. 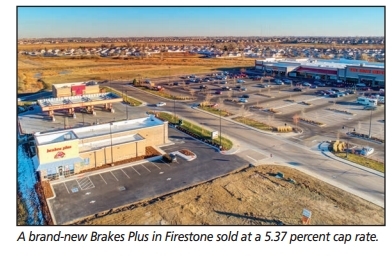 Brakes Plus occupies the property on a 20-year triple-net lease. Isaac and Brian Bailey of Marcus & Millichap were the listing brokers. Brandon Kramer and Jacob Rocker, also of Marcus & Millichap, represented the buyer.